Connect the ULINKpro debugger adapter with the board's Cortex Debug connector and with the host computer. 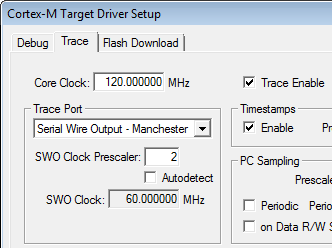 Under Trace Port set Serial Wire Output - Manchester. Disable Autodetect and enter 2 in SWO Clock Prescaler.